The Aurelia Quest White Nitrile Powder Free Examination Gloves sport a fingertip-textured fi nish that provides the wearer with optimal fl exibility and precise, easy gripping, even of extra-thin objects. These innovative gloves provide the fi t, feel, and protection of latex gloves but without the risk of an allergic reaction. Because they are made from 100% nitrile, ultra-sheer Aurelia Quest gloves provide superior durability without sacrifi cing safety or comfort. Each batch of Aurelia Quest gloves is air tested to detect pinholes. According to the manufacturer, Aurelia Quest gloves provide greater chemical resistance compared to other materials. In addition, the gloves conform and are tested to the highest international standards. Aurelia Quest gloves are designed in Clinical White Color, providing for a professional-looking glove. 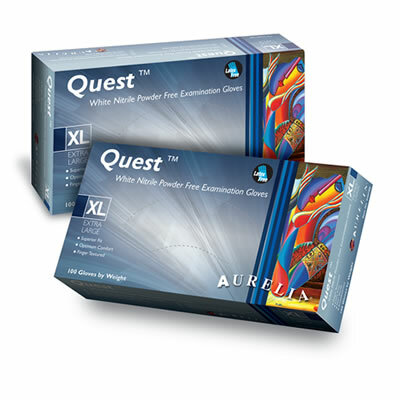 Aurelia Quest White Nitrile Powder Free Examination Gloves are cost-effective, single-use, and ambidextrous. Available in sizes extra small through extra large, Aurelia Quest gloves come packaged 100 gloves per box. Aurelia Quest gloves are manufactured by Aurelia Gloves, a division of Supermax Healthcare Inc. In 2009, Aurelia Gloves provided over 20 billion gloves to over 150 countries, according to the manufacturer. I have yet to decide which gloves are the best - there are a few up there to choose from. But in terms of the worst one, this brand easily tops the list. Stiff, hard to get on, slippery when wet, these gloves not only make easy tasks more inconvenient, they at times cause dangerous situations at work, for example, when I slip and drop the sharp instruments if the gloves get wet. My operatory definitely has no space for these gloves, not even a single pair.